This is not your typical war movie. It's an immersive visceral experience with a soundtrack by Hans Zimmer that vibrates your seat in the IMAX theater with an almost thrill ride experience. The cinematography by Hoyte van Hoytema creates an up close and personal experience while following the foot soldiers waiting for evacuation while bombs hail down upon them, the cockpit of fighter pilots in their aerial maneuvers and the civilians on the small boats from England that were commissioned to help. This is by no doubt an Oscar worthy contender from writer/director Christopher Nolan who began writing this story some twenty five years ago. 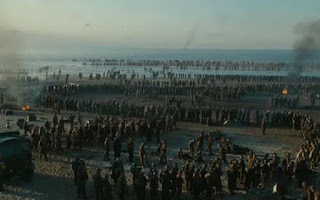 The film begins with a small troop of soldiers moving towards the beach for the massive evacuation as the German army had pushed the Allied forces at the beginning of WWII. Some 400,000 men were basically stranded by the water waiting for escape. The actual evacuation happened over a couple of months, but this story occurs over a day. The camera follows one resourceful young man who tries in various ways to get on a ship, but with every effort is stymied by sinking ships. Destroyers and first aid vessels are bombed and destroyed while the waiting men in long lines on the shore and piers dive for cover. Most of the military resources at the time were dedicated to other battles, so there scant help in fighting the attacking planes. Tom Hardy plays one of the pilots of three Spitfires sent to defend. Kenneth Branagh is the commander in charge of the evacuation, and Mark Rylance is piloting one of the small vessels that had set sail across the English Channel for the 39 nautical miles to rescue the troops. Cillian Murphy plays a lone solider rescued from a sinking ship that is suffering from the trauma. Fionn Whitehead and Harry Styles play the two main soldiers who do everything they can to survive. The minimalist dialogue reinforces the intimate immediacy of the experience, the fear, isolation and desperation. Little is given in the historical background of this particular event, instead the focus is what the individuals involved have to endure to get home alive and well. You become hyper aware of the smallest sounds of waves lapping on the beach over rows of bodies, seagulls flying overhead, the distant sounds of aircraft slowing getting closer, then bombs dropping. 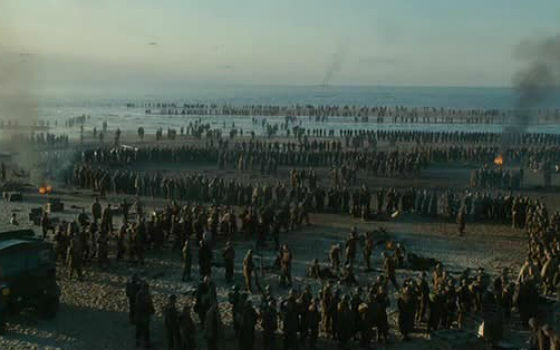 The sight of the motley group small vessels approaching the beach brings the most heroic moment in the film. A small story of the big war that could be mostly forgotten. The technical achievement of Nolan's film will certainly bring rightful kudos as it should. But one should not forget the profoundly moral message about the effects of war.